Looking for a vegetable prep set with countertop ap-peel? 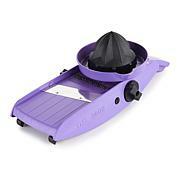 Enjoy safe and speedy slicing with this versatile mandoline and hand guard. Prepare julienne, French or waffle fries. Slice delightfully crunchy salad veggies. Four thickness settings let you ramp up your creativity. 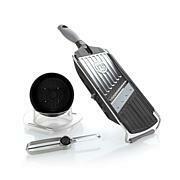 The included peeler set gives you even more vege-prep flexibility. And all three peelers snap together for convenient storage. Vegging out just got a lot easier. Love this it works really well and clean up is a breeze. I am accidental in the kitchen at times and not very mechanically inclined LOL. 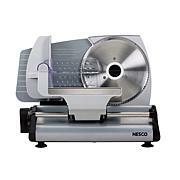 The slicer is very easy to use and I will get to keep my hands intact!!! I highly recommend this product!! 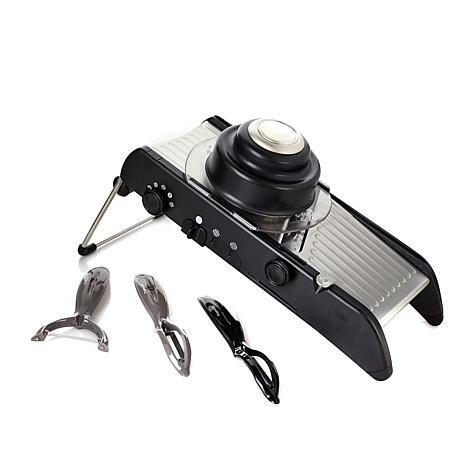 The perfect device to all your cutting and slicing without worrying about your fingers. Super sharp, cleans up easily. Great product. Perfect. I had the other one but then bought this because I liked the "stand" bracket fir more stability.